Ramblings of a couple of Epicureans in Tokyo. Kuumba du Falafel, Shibuya Shinsen, for when you get that odd craving for a falafel sandwich. Some Cuisines are hard to find in Japan and Middle Eastern is one of them. Kuumba du Falafel is run by a couple of young guys and in essence Falafel is pretty much all they do. Luckily they do it well. So next time you have that urge for a Falafel sandwich go find this little gem. It is right at the back end of Shinsen up on Kyu Yamate Dori. A poky triangular restaurant with I guess ten stools at a counter. Some might moan that a Falafel sandwich should be cheaper, but I doubt they have had such an artistically minded person put one together like this before. It almost looks like a flower when you get it. They are not overly heavy on the seasonings, but they have a nice Tahini drizzled over the sandwich. Personally, I like a little heat and the homemade Harissa is nice, not absurdly hot and salty, as some are, but milder and just right with the Falafel sandwich. The bean soup was ok, too plain for my taste but was good to have with the sandwich. The sandwich itself is full of salad, so you can feel like you have done your bit of healthy eating at least for this day. The Falafel made to order are still crunchy, warm and fragrant. I think this sandwich would win prizes if there was a Falafel competition. I encourage you to go and try this one lazy afternoon. Just as a nice little touch, check out their plates. They are designed to look like a paper plate. Very satisfying and pleasing to have found it in Tokyo. 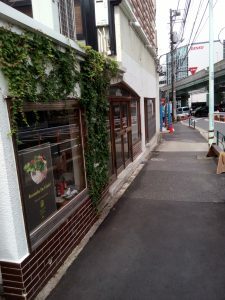 Author userPosted on February 14, 2017 31 Comments on Kuumba du Falafel, Shibuya Shinsen, for when you get that odd craving for a falafel sandwich. 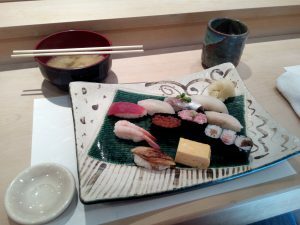 Abe Sushi, Hiroo, a great lunch spot. If you are in Hiroo and after a nice lunch Abe sushi is great. It is down by Tengenjibashi crossing a little walk from the Hiroo shotengai. The quality of the sushi is superb and the decor and service is nice. It is actually a chain and there is another in Roppongi amongst others. They seem to use a lot of younger sushi chefs so the atmosphere is a little lighter than some of the high brow sushi restaurants. The vegetables used at the restaurant are reportedly grown by the owners mother and I must say the miso soup, in which you find the vegetables, is really quite delicious. 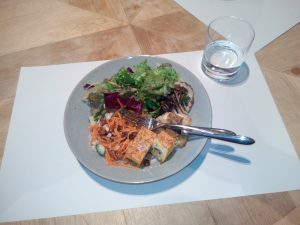 With the lunch you also get a nice little salad with a Japanese style caramelised onions dressing. You can opt for a Higawari 1100 Yen, Oomori 1500 Yen or similar priced Chirashi sushi options. There is also a course lunch and a high end lunch with Uni, Ootoro and the likes. You get to sit at a beautiful Hinoki counter and the room is nicely lit with wood panelling, which is a warm contrast to the quite bright lighting. All in all it is a lunch that is well worth trying . Enjoy! 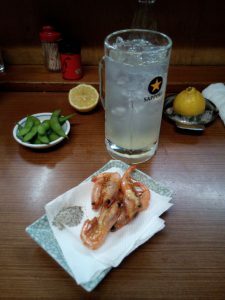 Author userPosted on February 10, 2017 February 10, 2017 3 Comments on Abe Sushi, Hiroo, a great lunch spot. 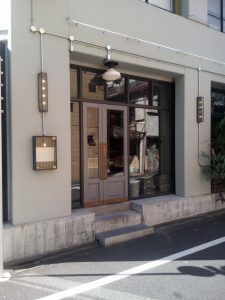 Ban, Yutenji, quirky place for a light diner. How do you describe this place? Well, what struck me was the ordinary nature of this place, and how much I enjoyed the experience of going there. If you speak and read some Japanese, and want to see a bit of real contemporary Japan, this is well worth a visit. No fancy decor. No fancy dishes. No special service awards. 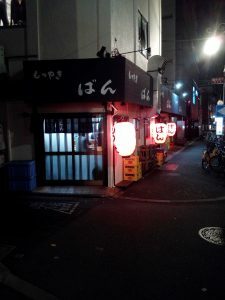 Just affordable, tasty food and a lively shitamachi (Suburbia) atmosphere. Along the Komazawa Dori, Motsuyaki Ban. I stumbled on this place returning from Toritsudai by bike. I had cycled past numerous times and was astonished by the fact it was always busy, despite a seemingly odd location a fair way from any station. I chanced it and entered. There was the din of chatter, a waft of grilling meat and bright lights as I walked in. The locals took a split second to see the odd looking gaijin who just walked in and straight back to their banter. There are actually two parts to the restaurant and three doors. I guess testament to an ad hoc expansion at sometime and the fact that the inside is a little cramped. Ban advertises as a Motsu Yaki restaurant on their Chochin (Paper latern) outside. Originally it was in Meguro for 40 years or so and 12 years ago moved to Yutenji. So ready for a little bit of pig offal on skewers, I sat at the counter. A minute or two deciphering the menu and observing the place, gave me some hints on what to order. I went with a Lemon Sour, Ama Ebi kara-age, raw cabbage, and a mixture of skewers some of which I had no idea what they were. And so began the evening. The three young ladies behind the counter talked Chinese interjecting the odd word of Japanese as they took the order. The two middle aged men in the kitchen were busy chopping sashimi and grilling skewers. 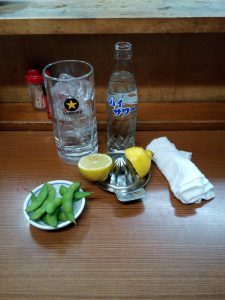 A Lemon, a jockey of ice and shochu, a lemon juicer and a bottle of soda were plonked in front of me. I am not sure why but the lemon seemed remarkably juicy. I used just one half and half the bottle of soda seemed enough to fill the jockey. The otoshi (amuse bouche) was eda mame. The Lemon sour was strong shall we say, and very refreshing. The redness of the faces of many of the patrons was testament to this drink. Then the ebi and the cabbage and skewers came. All very pleasant. I will share a bit of terminology here for those who decide to visit. Furansu was neck meat. Kashira was meat from the pigs head. Tsukune was minced pork and the second variant with Nankotsu (cartilage) added a nice crunch. Tepou was intestine of some variety. It had a slight odour, reminiscent of the french Andouille (Pig intestine sausage). 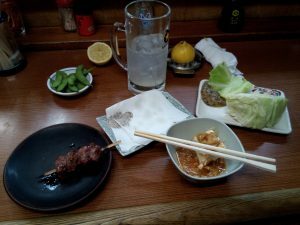 I would opt for Tare (dipped in sauce) for the Tepou and Tsukune, but the meat skewers I prefer with salt. I noticed a few ordering Piman (Green Peppers) to eat with the Tsukune. A mix I can recommend. The bitter crunchy raw Piman, with the sweet tare meaty Tsukune is a little delight. There are plenty of mysteries on their menu. I suspect I might not like them all but this night worked out well. 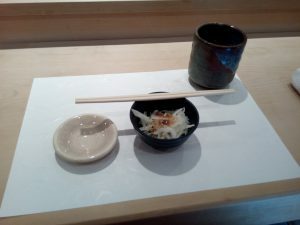 Raw cabbage with miso, Hiyayako and Kashira. Another interesting lesson was learnt when, my neighbour ordered “Nakami dake” and proffered his empty jockey. This order was for a shochu refill. Having drunk most of mine, I thought I should do the same. This is likely why they give you a whole lemon and why only half the bottle of soda fits in the jockey. After a little banter with my neighbour, a pottery wholesaler, last orders came and went. One of the chefs offered me a bowl of NikomiDofu. They had a special name for it which escapes me, but the heat of the Nikomi did not escape me. My neighbour informed me that the spiciness of the Nikomi varied day to day, upon the mood of the chef, but that todays was on balance rather mild. I should not like to order that on one of his bad days, shall we say. Still it brought a very pleasent evening to a close. The bill 1950 Yen, an hour and a half well spent soaking up a bit of Japanese day to day life. There are plenty of mysteries on the menu and this place will never get awards, but it seems to have earned a place in the hear of many of its patrons. I plan to revisit with some friends to get get through a little more of the menu. 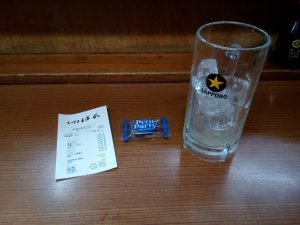 Author userPosted on February 9, 2017 2 Comments on Ban, Yutenji, quirky place for a light diner. The quote is from a friend of mine who visited. Suzuran is small, just 11 counter seats. Its decor is finished to a high standard unlike many Ramenyas. Lighting is warm and the room is nicely air conditioned. From this alone it comes across differently from your traditional Ramenya. The pricing too is above average. Still for those who pilgrimage here the quality is exceptional. In fact, Suzuran began in Shibuya about thirty years. 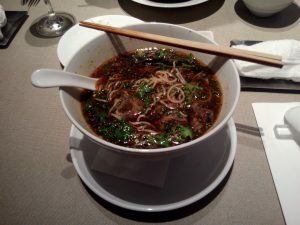 Known for its home made men (noodles) it had a strong following and a fairly ordinary menu. It was when it moved to Ebisu that Suzuran really blossomed. The menu was upgraded significantly and took in new styles. 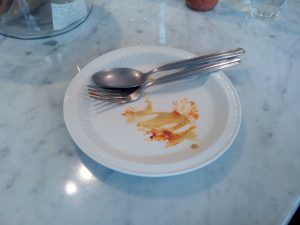 Not haphazardly though, with a keen respect for the new dishes they took on. Gone was Shio Ramen, Miso Ramen. In came Donabe Mabou Men, Kuri Tan Tan Men and others. The attention to detail at Suzuran is wonderful and presentation is given an appropriate amount of respect, including some dishes with height and bowls reminiscent of a fancy French restaurant. Even on their simplest dish of Chukamen, care was taken to add some crazily tasty powdered scallop and pork, just hidden under the shredded negi. The Kaku Ni Men, where the braised pork belly comes on a side plate, is perhaps their signature dish and you won’t find better Kaku Ni than this. The noodles, home made, are predominantly a Hosomen, which keeps its Hagotai (al-dente texture) perfectly the time it takes to eat it. The soup stock is clear and a mix of the sea and the land. Most of the menu is Shoyu based but their specials offer plenty of off the beaten track choices. The flavours are strong and powerful in all the dishes. Suzuran really offers you something to feast your eyes and taste buds on. In terms of atmosphere my friends’ quote catches the mood. The place is quiet and church like. There is no “Irashaimase!” screamed out as you walk in. People tend to eat quietly and you rarely see big groups. Weekends and some evenings you may have to order a drink too. If you do and you like Yuzu, the Yuzushu is phenomenal. You might like to add just a splash of water as the Yuzu flavour is very powerful. If you know Ramen culture in Japan you will immediately feel the difference between this place and the rest. This is a celebration of a staple, that elevates it to a higher level. You can only applaud the owners who took the time to really reconsider what Ramen can be. No need to recommend a dish at this place. They are all wonderful. Unfortunately no photos. Masa’s Kitchen 47, Ebisu, lunch with friends. Masa’s Kitchen 47, hidden away in a basement at the back of Ebisu is a lovely Sichuan chinese restaurant run by Masa. The decor is modern a little cool but very well done. There is an imposing marble counter behind which is the kitchen, bustling with chefs and the clatter of the woks. The lunch menu is simple a short course menu or a choice of a series of different noodle or rice sets. The sets come with truly divine Shoronpou, served with black vinegar and finely julienned ginger. Pricing is around 2000 Yen or a litle under, which for Tokyo might feel pricey, but diner here is at least 10,000 Yen. The food is predictably spicy, but not pure heat. The chef has taken care to make it rightly spicy. The use of Sichuan peppers and Chillies leave a very harmonious tingle in the mouth. The food feels authentic and there are some lovely details. The Mabou rice comes in a clay pot, which when served is puffing steam as if a dragon was caged inside. The Okoge at the bottom must be something to relish. 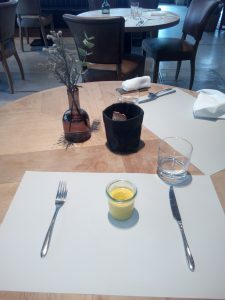 The small soup and the two small amuse-bouche included just take the lunch up a level and make this a lovely lunch spot. It would probably be wise to book, if you decide to go. Queues have been witnessed before and it fills up quickly. On the basis of a couple of lunch visits, Masa’s is likely to be a decent diner spot too. Hopefully a pleasure to be had in the future. 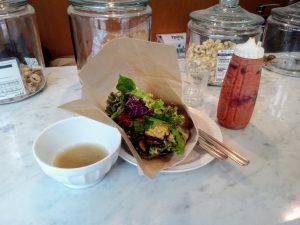 Author userPosted on November 7, 2016 February 9, 2017 Leave a comment on Masa’s Kitchen 47, Ebisu, lunch with friends. In a somewhat off the beaten track place, all the way up the Meguro river, is an old converted warehouse. On the ground floor is Stall a cafe/restaurant. This place is great for a quiet easy lunch. Food is western. The menu limited but adequate, a Salad, a Deli plate, choice of two Pasta dishes or a Meat dish. The lunches come with soup, bread and coffee or tea. I plumped for the Deli Plate with 5 salads; a nice green salad with vinaigrette, sweet potato quiche, non traditional Tabouleh, carrot rapée, and a small piece of grilled chicken. The soup was a nice little pumpkin soup. 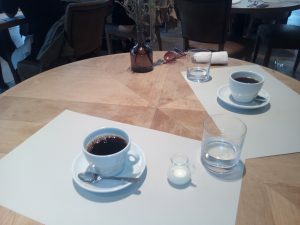 The bread basket of lightly toasted brown bread and the coffee were both of a good standard. The food is very acceptable, not extraordinary, but above par. For 1200 Yen there are certainly no grumbles. However it is the interior decor and spaciousness that tip this place over into the worthwhile. Being what I assume is a warehouse conversion, the ceiling is nice and high. 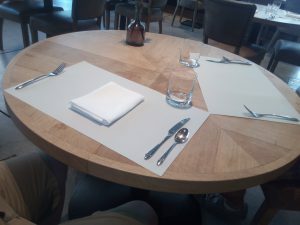 The tables are large, with plenty of space around them. The large windows on this sunny day made the room very bright and the quality of the interior design, the furniture, the linen napkins, the heavy set tumbler for water just gave it all a little “Je ne sais quoi”. I would be tempted to come back of an evening to see what the cocktails are like. So treat yourself to a nice stroll along the Meguro river. Lunch at Stall, followed by a walk back popping into a few of the small designer clothes shops. It will be an afternoon well spent. Welcome to Tokyo Food Odyssey. Tokyo is a lovely place for many reasons but food is surely one of the top draws. From the raw to the cooked, the sweet to the savoury, the street food to the Michelin starred meccas, the Japanese to the foreign, it is a perfect place for a gastronomical odyssey. This Blog will give the curious a little eye into the world of food in Tokyo. For those lucky enough to be here on holiday or living, hopefully it will inspire you to explore some of the off the beaten track eateries or less well know dishes that can be found. More than anything you can expect to find restaurant and food reviews. You will also find a few recipes and diatribes about etiquette, authenticity, shop design, and ambience. Happy reading!